Event dates for 2020 are February 15th and 16th. Registration will open in the fall of 2019. On Facebook – Check out our event page on Facebook. Sign up early and save money on your registration. Take advantage of last year’s prices through December 1st; registration will go up to $76 for the 25k, $96 for the 50k, and $122 for the double after December 1st, so if you’re planning on getting muddy in 2019, don’t delay! Parking passes are included in this year’s registration fees. ORRC Members save $10 per race and will need to use a code to redeem your discount. Please email haggmud@oregonroadrunnersclub.org to get your discount code. The Hagg Lake Mud Runs are run on two separate days. You can choose to run the 50K (two loops) or the 25k+ (one loop with the extra long out & back – about 17 miles) on Saturday, the 25K on Sunday or (if you are feeling extra crazy) you can run both days! You will earn a special growler full of beer, cider or root beer if you finish the double; a 64 oz growler for the 50k/25k combo or a 32 oz “baby” growler for the 25k/25k combo. In an effort to reduce the footprint of our race, we encourage runners and volunteers to please rideshare when possible. If you are looking for a ride to our race, please feel free to post on our Facebook page. January 5. Group training run out at Hagg Lake. What a better way to prepare for race day than to run around Hagg Lake! We meet at the large parking lot on the far side of the dam. View Training Run event on Facebook. January 14. Last day to order a long sleeve tech shirt for this years race. The race shirt is an optional purchase separate from registration. January 26. We will work to ensure the trail is ready for race day — we’d love your help (let us know by emailing us at haggmud@oregonroadrunnersclub.org). View Trail Work Day on Facebook. February 4. Last day to register for the deadline to guarantee your growler. You may register for the double after that date, but while we will do our best to accommodate you, we cannot guarantee a growler for you at the finish. February 14, 6 to 8 pm, Lucky Lab, 1945 NW Quimby St, Portland. Join us for a beer and social hour and pick up your packet, too! Don’t worry if you can’t make it — You can pick up your packet at Day of Race check in for each event also! If you’re interested in volunteering for this event, please visit the event website and click on the volunteer button. Volunteer registration will open in January. It takes many people to put on this two-day event — we need your assistance to make Hagg Mud awesome again this year. You may also email us at haggmud@oregonroadrunnersclub.org. For more information on ORRC volunteer opportunities, click here. All past results and photos are available – click here. Hagg Mud Top Ten Times – click here. 2017 Hagg Mud Double Times – click here. We are not offering an early start this year. We are starting everyone at 7 am, and we’ll keep the course open until 4 pm, which gives you 9 hours to finish. A 9-hour 50K finish requires a 17:10 minute mile average pace. Cutoff for the first lap is noon. Any runner not through the start/finish line for their second lap will be unable to continue. We added additional cut off times in 2018. You must be through the dam aid station by 1:15 pm and through the Fenders Blue aid station by 3:00 pm. This is a 17:10 minute/mile average pace. There is no early start for the 25K. Hagg Mud is a running event; it is not a walking event. You must be able to maintain an average pace of 17:10 per mile in order to meet the cutoffs. We understand that walkers would like to participate but we need to keep in mind our volunteers that are working race day. We will enforce these cutoffs. 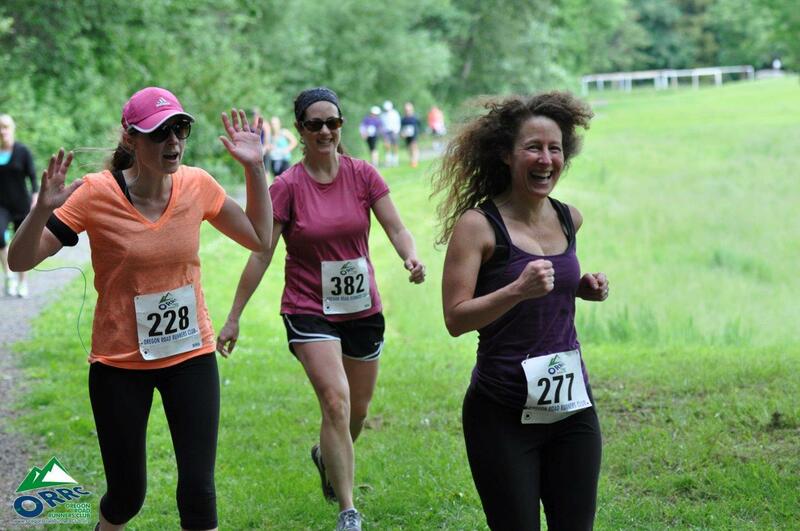 For this reason, if you are unable to run at all during Hagg Mud we ask that you not sign up. The 50K consists of a group start at Boat Ramp C. Runners enjoy a little over 3 miles of an out-and-back on a gravel road. This really helps runners to spread everyone out along the course. Please note that this is the biggest elevation change you will encounter for the entire race. When runners come back through the start area, they’ll have a chance to shed clothing and prepare for trails. This is when the mud starts. You will run around Hagg Lake counter clockwise 2 times on the single track trail, pass by 5 aid stations including the start/finish, and eventually make your way back for the post-race festivities. The Saturday 25K+ course is the first loop of the 50k race. Total distance is approximately 17 miles. We are keeping the reverse direction for the 25K in 2019! The 25K consists of a group start at Boat Ramp C. Runners will begin with a loop through the Boat Ramp C parking lot before hitting the trail for a short distance; they will then enjoy about a mile of an out-and-back on a gravel road. This really helps runners to spread out along the course but please note that this is the biggest elevation change you will encounter for the entire race. When runners come back down to the trail, they’ll have a chance to shed clothing in a drop bucket. This is when the mud starts. 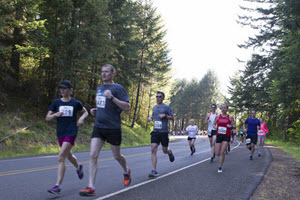 You will turn back towards the start finish and run around Hagg Lake in a CLOCKWISE direction on the single track trail, pass by two aid stations and eventually make your way back to the finish and post race festivities. Food and hydration. Aid stations will be well stocked with the usual Ultra fare: PB&J, bananas, oranges, gummy bears, trail mix, chips, GU gels and GU electrolyte drink. Our race is cupless; we will not provide cups. You will need to carry your own refillable cup, bottle or hydration bladder. Potties. There will be a porta-potty at each aid station. Basic first aid supplies. We will not have painkillers at the aid stations, so you are responsible for bringing any such aid as needed. You are responsible for knowing what you need. If the aid stations are too far apart, it is up to you to bring your own aid as well. If you are injured on the course, you can drop out at an aid station and a volunteer will drive you to the finish. We ask all participants to notify aid station volunteers of injured runners that they pass so we can pick up the injured runner in-between aid stations and get them aid earlier if needed, or if they can not make it to the aid station on their own. Please note: our race is CUPLESS. You will need to carry your own cup, hand held or bladder for hydration. New in 2019: We are assessing at $1.00 Environmental Impact Fee on every registration to help us cover the costs of recycling for this race. In 2018, we were able to limit our waste to just 4 pounds for the entire weekend. However, there are some significant costs associated with making this a reality; this fee will enable us to reduce our impact to nearly zero. an exceptional experience for all – runners, volunteers, and spectators. efforts and what you can do to help. We are offering two shirt options this year; a short sleeve tech t-shirt and a long sleeve, ¼ zip technical shirt. Additional details are available on Ultrasignup. Orders must be placed by January 14th to guarantee a shirt. Limited stock will be available for purchase at the race. Checking out your race splits on our finish line tablets. After each race, we will be providing racers with a post-race meal, including grilled cheese sandwiches, hot homemade soup, chips, desserts, and cold and hot drinks; along with standard ultra-fare. Don’t be shy about asking for vegetarian options. We have them available but do not put them out until requested as they are not as popular. Please fill up. Most of the food is perishable and will be composted (along with the dishware) or donated. We will donate what we can, but we would love to see everyone enjoy it all. Awards will be presented at the end of each race as the finishers complete their race. Because of the wide range of finish times and the usually inclement weather, we do not have an awards ceremony. The 25K and 50K will present awards to the top 3 Submasters (Under 40) Male and Female runners and the top 3 Masters (40+) male and Female runners in each race. If you think you won an award, please check the kiosks and pick up the award before you leave the race. In addition, there will be a fun drawing for great prizes from all of our fabulous sponsors! All participants have a chance to win raffle prizes. In order to enter the raffle, it is important that you check in with the registration table even if you have already picked up your packet. After the race starts, we will draw bib numbers and post winners on a board. Just check the board after the race, and if your bib number is listed, check in at the prize table to claim your prize. Check out the list of 5 year Hagg Mud veterans – the Hall of Mud – click here. Headphone Policy. The use of personal music devices is strongly discouraged at this race. To enjoy all that our race has to offer and for the safety of all participants, ORRC encourages a headphone-free environment during the running of the event. What are the cut-off times? There are cut-off times only for the 50k. Participants must be through the Start/Finish Line at Boat Ramp C (one loop around the lake, 17.1 miles) by 12:00 pm. We are adding additional cut off times in 2018. You must be through the dam aid station by 1:15 pm and through the Fenders Blue aid station by 3:00 pm. This is a 17:10 minute average pace per mile. Can I bring my dog?Unfortunately we have had to implement a no dog policy for this event as a requirement of our continued insurance coverage. We thank you for understanding and for leaving your four legged friend at home. How can I register using ORRC Bucks? If you would like to use ORRC bucks to register, please email us at haggmud@oregonroadrunnersclub.org with the following information: Name, address, phone, age, emergency contact name and number, distance, amount of ORRC bucks to be used. Registrations using ORRC Bucks will be accepted when online registration opens. This means you can email us before online registration opens but your email will not reserve your place. After online registration opens, you should email us, and we will hold a spot for you for one week. You will then have one week to mail us your ORRC Bucks in order for us to lock in your spot. All ORRC Bucks used for registration must be signed by an ORRC RD and be used before their expiration date. You will receive the address where you need to send your ORRC Bucks when we receive your place-holding email. Refunds/Entry Transfer? Please read our refund/transfer policy carefully. We do not make exceptions to this policy for any participants. We are volunteer race directors and we have created this policy to make registration and race organization manageable. Thank you for understanding. There are no refunds or transfers of your registration. If you are unable to attend please know that your registration money is helping better the running community in the Portland area. We are a non-profit organization. How do I get on the wait list if registration is full? Once registration is full, the registration page will turn into a wait list sign up. Available slots will be offered to people on the wait list to register based on a first come first served basis. 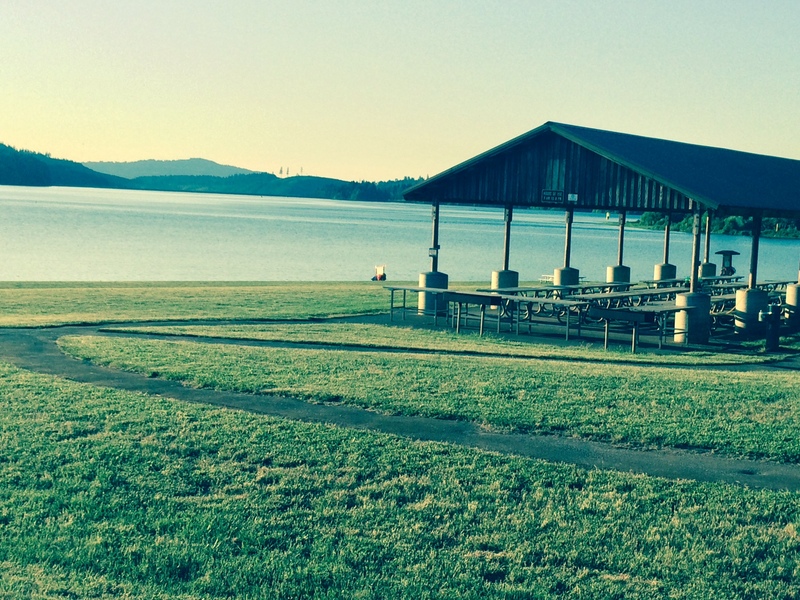 Who puts on the Hagg Lake 50K and 25K? The Hagg Lake Mud Runs are put on by Oregon Road Runners Club. The race is 100% volunteer-run, including your race directors. When will the race results get posted? Huber Timing will have real-time results available at the tablet station in the pavilion. Official results will be posted same day as the race.